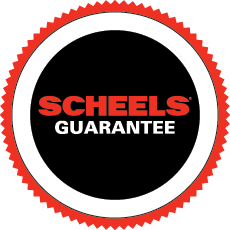 The current SCHEELS Hardware has made a significant move and expansion to 3202 13th Avenue South in Fargo, which was the previous location of SCHEELS All Sports. This expansion allowed for the new SCHEELS Home & Hardware to double its size to over 45,000 square feet of sales area. With the additional space, the new store features; an expanded lawn, garden, deck, and patio outdoor living shop; interior/home decor and accents for every room of the house; an in-store cafe serving fresh coffee and baked goods; a complete fastener and hardware shop; a rental equipment shop; a full service paint and color center offering in-home color consultations; the Pride of Dakota shop; a cooking demonstration area; and a motor/service shop, where certified service technicians can repair, or simply tune-up everything from a chainsaw to a snow blower.